PROMISE When hospital doctors told Victor Skimmeland that they had run out of options, he decided to hold on to a promise given by the Israeli King Solomon. 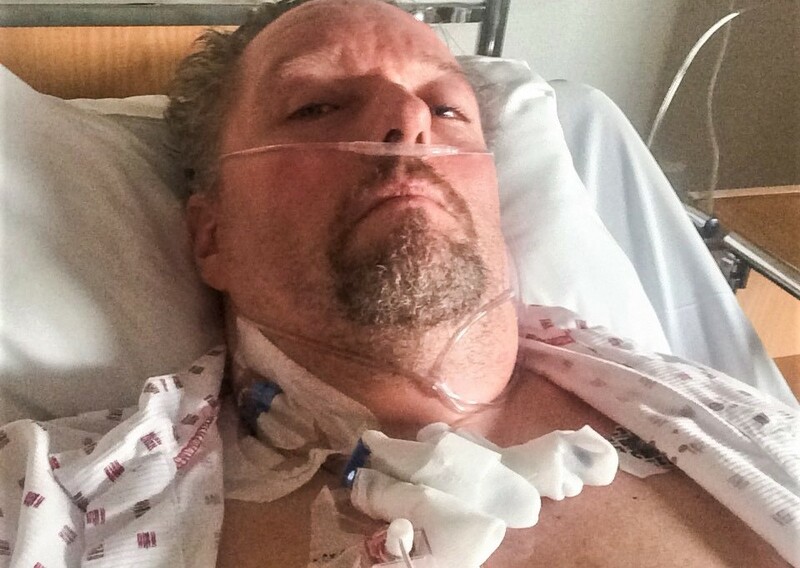 Coming spring of 2015, Victor Skimmeland, now aged 54, was starting feeling weak. He frequently experienced nausea and dizziness and made an appointment to see the family’s General Practitioner for a check-up. This article is being published as my personal testimony in order to supporting everyone searching evidence in faith. In my opinion faith may firstly serve to strengthen those among us who already believe, both for continuing life and in preparation of death. For those who do not profess any faith whatsoever, the whole idea of believing may seem utterly meaningless. Some will not even recognize the well-documented placebo effect (even though I myself consider my miracle to be much more than placebo). However, God’s way of convincing his children knows no limits, so here we go, anyway. I am so privileged in having received a healing miracle but I have also followed believers all the way to life’s end. I have been allowed into their lives as their pastor, and I have taken on this heavy mantle with joy. This piece was first printed in the national, Lutheran daily newspaper «Dagen» (This Day) in September 2017. Previously, I was allowed to hand out PDF copies to those interested but earlier this year the reporter permitted a full text version online and in several languages. Thank you, Mr. Kenneth Fjell Rasmussen. Please note, form and format being Lutheran is not the best representation of my personality and preaching style but it is still the better way to reaching the rather modest and secular Norwegian reader. Please FOLLOW and LIKE preacher.no on Facebook. Do SHARE the content with your friends. And do indeed sign up to our free and ad free NEWSLETTER. This piece was originally printed in «Dagen» in Norwegian with the title: «Kreftfri etter reise til Jerusalem» (subscibers only). A print copy (in Norwegian) may be obtained here: «Kreftfri etter reise til Jerusalem» (PDF). The GP believed his condition to be just the benign paroxysmal positional vertigo (BPPV), a disorder caused by changes in the positioning of one’s head. He prescibed drugs thought to alleviate the pain and dizziness until the disorder eventually would fade away on its own. ‘I only got worse, however, and one day I suddenly fainted. My wife took me to the emergency room, which quickly ambulanced me to the hospital,’ Mr. Skimmeland says. The doctors at the hospital immediately found a huge tumour situated on his brain stem. The following three days were passed in a semi-consciousness state while he was made ready for brain surgery. It quickly turned out that Mr. Skimmeland had attracted a malignant melanoma that rapidly had metastasized into the brain, lungs, bones and lymph nodes. ’Back at our neighbourhood hospital my wife and I were summoned to a conference with the neurologists. We were told that the brain tumour was far too advanced and that little could now be done. I perceived that I would be dead within weeks, and the hospital advised me to write up my will,’ he says. The situation impacted severely on him but he never sensed any fear. ‘That’s the day when I gave my life to Jesus. That dream gave me peace of mind. I did not receive any promise that I would survive but I knew that Jesus would stay with me, no matter what,’ Mr. Skimmeland says. He emphasizes that he never succumbed to any fatalistic thoughts – i.e. the idea that fate is determined and that there is no point in fighting – but he was still prepared to ‘go home’ if God were to call on him. METASTATIC. Only weeks after cancer was discovered the oncologists found metastases to the brain, lungs, bones and lymph nodes. Photo credit: Kathrine Skimmeland. However, Victor Skimmeland’s wife never accepted that there was no hope. ‘Kathrine understood the seriousness of the situation and decided to stand up and fight for me,’ he says. During the autumn of 2015, she refused to give up even though the medical staff was certain that all hope was now lost. She got Victor a new neurosurgeon who conducted several additional investigations, followed by an additional surgery removing most of the brain tumours. ‘Before my third brain surgery, the neurosurgeon indicated a less than a 50 percent chance of survival. But then the alternative was that, without surgery, I had a 100 percent certainty of death within a very short time. The choice was easy, and my wife made it,’ Victor says. Late in the autumn, Victor also followed the example of St. James (5:14-15) and called on his elders. ’I maintain my membership with the nominal Church of Norway but of course I rang two Pentecostal ministers whom I trust. They arrived for a visit with their wives and anointed me with oil and laid hands on and prayed over me,’ he says. Victor acted on the Word of God. God then acted on his promise. ’After having the four pastors interceding on my behalf, the cancer immediately stopped metastasizing. Indeed, I was to go through one additional brain surgery at The National Teaching Hospital (Rikshospitalet) in Oslo. It had been programmed even before the prayer took place, but the surgeons were in for a big surprise,’ he says. The neurosurgeons could not find any remaining tumours in the brain, only a trace of a bleed. Victor was transferred back to his local hospital which had previously given up on him. The local hospital now reported that he would be able to live for a while, but that he in no way was healed. The chance of long term survival was still close to zero. He was given an inhibitor drug, a variant of immunotherapy which aimed at postponing inevitable death. ’I consider myself a generally positive person, with an easy-going faith, but eventually I started losing hope again,’ Skimmeland says. It was only going to get worse. During the spring of 2016 it became clear that the therapy did not work as well as one had hoped for, and in the early days of July 2016 Victor sat down for a serious conversation with an oncologist specialising in his kind of cancer. ‘She was convinced that my cancer had returned and pointed to two places on my back. I thought I could feel how the tumours were situated inside my lungs. For the second time the hospital told me that there was no more they could do for me. I was going to die, again,’ Mr. Skimmeland explains. He prayed to God and discussed the subject at hand with his wife before coming to a new decision. ’I asked the hospital to transfer me to another hospital in a neighbouring county,’ Mr. Skimmeland says. That was the hospital of his home county. The transfer was delayed, and while waiting for a confirmation he felt God calling him to venture on a pilgrimage – to Israel and the remains of the temple of Jerusalem. ’God had healed me there once before back in the nineties. I was on a journey with the theological seminary I then attended. My wife and I very much desired to have our own, biological children, but I was sterile from a former illness. 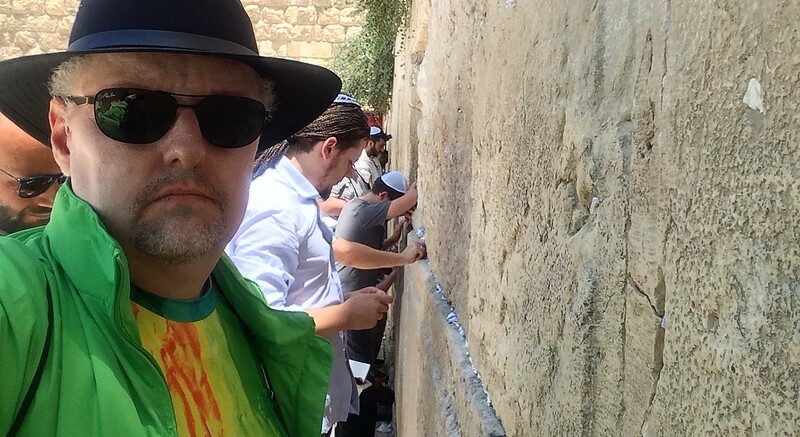 Three times I went to the Western Wall to pray to God for a miracle (blog post in Norwegian). The last time I heard a voice calling out, Y’ou are praying for something which I have already given to you,’ Victor says. Not long after the Jerusalem encounter the Skimmelands journeyed to Colombia where they took up a calling to serve as missionaries. This is where and when their daughter Andrea Natashah was conceived and born. WESTERN WALL. 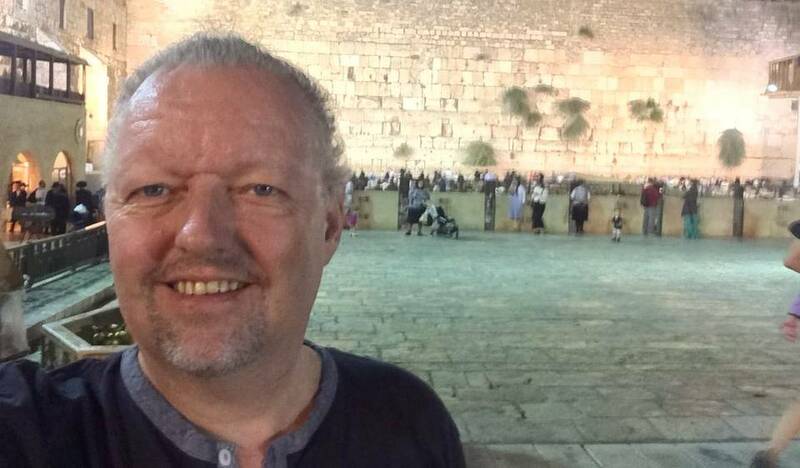 During last year’s pilgrimage to Jerusalem, Victor Skimmeland walked twice a day to the Western Wall in order to pray. Photo credit: Private. As for the foreigner who does not belong to your people Israel but has come from a distant land because of your name — for they will hear of your great name and your mighty hand and your outstretched arm — when they come and pray toward this temple, then hear from heaven, your dwelling place. Do whatever the foreigner asks of you, so that all the peoples of the earth may know your name and fear you, as do your own people Israel, and may know that this house I have built bears your Name. ’I was well aware that this was a prayer by King Solomon and not a general promise by God, but I took these words to heart when I journeyd,’ he says. Late that summer of 2016 he booked a room in a guesthouse in East Jerusalem and during his entire stay he went to the Western Wall to pray both morning and afternoon. He stood facing the very same place that the Old Temple used to stand. ’I felt nothing while I prayed, except that I was awfully exhausted,’ he says. A new hospital appointment was delayed for two months but finally he was booked with the hospital in the county of his ancestors. He was now a so-called N.E.D. – No Evidence of Disease. ’They declared me cancer-free, as I still am today, one year later,’ Victor Skimmeland says. He has no doubt that this was God intervening. The oncologist in Skien, Dr. Dalia Dietzel, confirms in a statement to «Dagen» that she found few traces of cancer when she examined Mr. Skimmeland in the early autumn of 2016. Her explanation for this sudden change, however, is that the medication which he continued to use while visiting Jerusalem, must have worked after all. ‘We will now treat him with immunotherapy for a total of two years, and we will conduct follow-ups under way. If all goes well, we will then end his treatment. Further follow-ups will show if the disease reappears or not,’ the oncologist states, adding that the healing of Mr. Skimmeland can be scientifically explained after all. Mr. Skimmeland, however, is convinced that God has laid at least one finger on the scales. He cannot fully praise the efforts of his family. Without the help of the family members he believes that he would have resigned when the battle against his disease was at its fiercest. His sixteen year old daughter Andrea Natashah confirms the popular opinion of the family that it was a tough, uphill battle. ’At first I found it difficult to believe that my father had an incurable disease, but it eventually downed on me. At times I was both angry and sad that such an attack had hit us,’ she states. Finally she started feeling ready to bide her farewell with the father, but hope remained all the while that Dad would somehow be healed. SLOW LIVING. Victor Skimmeland has shown no traces of cancer for more than a year now. He is, however, suffering verious adverse effects after a number of surgical procedures and maintains a much slower pace than before. Here present doing some gardening in front of the family home in the town of Sandefjord. Photo: Andrea N.B. Skimmeland. Although his cancer is now long gone, he still struggles with a number of adverse effects from the disease. He has been through a number of surgical procedures in the brain and is now hearing-impaired. Additionally, he suffers from grave tinnitus, while his vision is partially damaged. He is also struggling with occasional epileptic sensory disturbances. It happens that he asks God why He did not fully heal him. ’I honestly do not know all the answers to that question, but I know that God is using me in new ways. Since I am now forced to pace myself more than before I also have more time to spend together with God in ways I never did before,’ he says. Mr. Skimmeland states clearly that the journey to Jerusalem was a personal calling to him and that God not necessarily will meet all other believers in the same manner. Ever since he received Christ in 1983, he has experienced hearing what he believes to be the voice of God, and God has often shown him people to whom he will have to speak and engage in prayer with. – Because of all my ailments I am back at the hospital on a rather frequent basis, and every time I meet someone with whom I can talk about Jesus,’ he says. In the beginning he managed to establish a particularly tight relationship with another sick man on immunotherapy. That man passed away last May, however, but Victor was able to accompany him all the way to the end. ’I was with him in friendship, through profound talks and during prayer. I laid my hands on him to alleviate his pain and delay his death, and I’ve nursed and medicated him when we went travelling together. God told me that he would give him one extra year so that he could get ready to receive (Christ). He lived quite well for a year before the cancer hit him back last March. Thirtysix hours before he died, I prayed with him for his salvation. I had already prayed with his wife in April. Most likely she had faith already the but professing her faith in Christ was a good thing for her to do,’ Victor says. Mr. Skimmeland has spent the major part of life in Christian ministry, both in full time service, as well as a volunteer. He will continue to do so for the foreseeable future. ’I may spend even more time serving now as an evangelist. I wish to continue sharing our Christian hope and what God is doing every day,’ he says. Victor Skimmeland is married to Kathrine, and has served with a BA in Theology plus a Business Candidacy Degree as a missionary to Colombia for the Norwegian Covenant Mission, together with his wife. Victor used to hold various positions in Norwegian mainstream media, both as a journalist of the town daily Porsgrunns Dagblad, as well as a contractor with the Lutheran national daily newspaper Dagen. 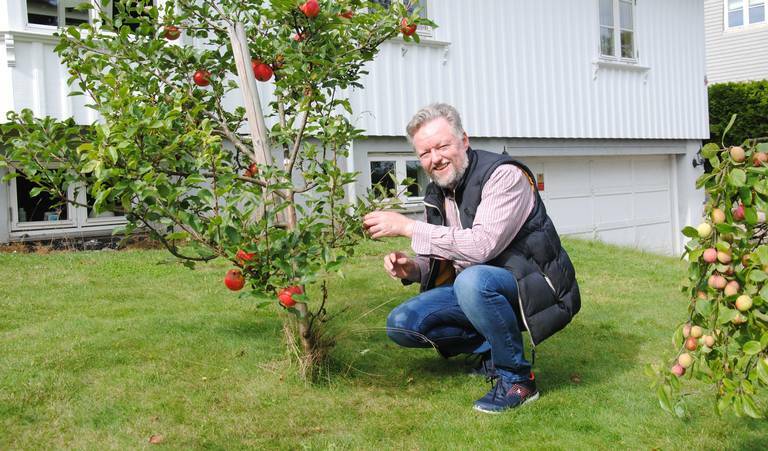 Having joined the Lutheran Church of Norway with an MA in Theology more than a decade ago he has continued serving as a youth minister in the town of Sandefjord. He was subsequently hired with an additional BA of Intercultural Studies by the Norwegian Church Aid, serving as Regional Coordinator.